Yes. Shhhh. But I'm not too worried he'll see this. He only does his obligatory skimming of my blog once a week or so. How much patience you have. I would be delightful if I recieved a card like that! this is a very cute idea! I love it! ARGH! I love this so, so, SO much! What a delightful card. I can't wait for the next birthday. Thanks tons, I'll be linking. I am absolutely in awe of this card! So simple and sweet! So you 'make' him read your blog, huh? Poor ALEX. Such a fun and sweet idea ! So sweet it makes my teeth hurt. Love it! This is such a fantastic idea - thanks so much for sharing it! That is rockin' cool! I loved your bows too and made some the other day and linked to you... So inspiring, thanks for all you share! you are brilliant! i love it!! Mum, I'm not the one obligating Alex to read— I don't care if he ever looks over here. But his female coworkers sometimes want to talk to him about the latest post, and he feels terribly embarrassed if he doesn't know what they're referring to. He thinks a good husband would read his wife's blog, so he tries. He's so cute. I love him. Ladies, too bad for all of you because he's mine. See, Sweetie? I'm talking about you, and you'll never read this. Good thing, or you'd be mortified. Heh heh. I know you never get as far as the comments. Ooo! What if you did something like this kind of garland (http://madebyrae.blogspot.com/2010/01/easiest-heart-garland-evar.html) to make a Valentine's card! very very cute ! thanks for sharing ! Love this! I'll have to make some as soon as I find some time! I am in love with this design! I am totally making some of these cards! LOVE IT! So darn cute! I just blogged it as a follow-up to a garland post I did yesterday. Thanks for the inspiring idea! Love it. A girl after my own heart. I'm a little bit addicted to miniature bunting. 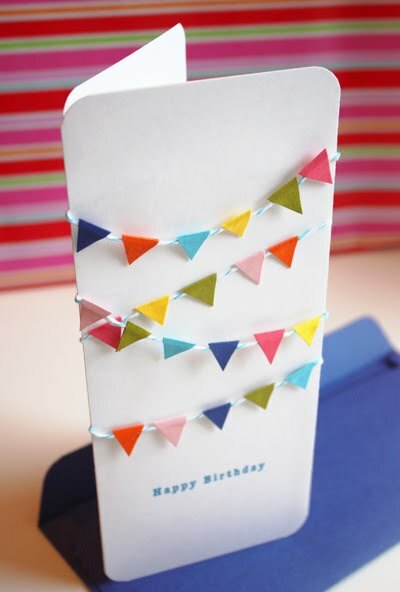 In fact, I've been making and selling cards with mini fabric bunting online for a while now. I love making them so much that I think my friends and relatives might be getting a tiny bit sick of receiving them! very cute! I've bookmarked this for future inspiration. I see little punch out hearts on a card like that in my near future! Thanks for the great idea. oh man, that card is great! I've been really into creative birthday wrappings/cards lately and this really fits the bill. thank you! Beautiful!and Happy Birthday to your spiral-binding/spell-binding guy! This is too freaking cute. You are so creative. What a great husband you have!! And you don't even get to celebrate his birthday till Sat. BUT, you get to do it ALL DAY then! Yay! very inspiring for the coming party invites! The first thing that came out of my mouth as soon as I saw the photo was: Awwwww! I don't know what it is about the flags and the all of the banners these days, but I love them. What got me hooked on your blog, other than you incredibly inspirational projects and design expertise, of course, is your dialog with Grandma G (hi to you too, because I know you're reading this--and I have been bad about emailing). Priceless. wow, it is so clever and cute! I love it! I really like this - and what a great use for little scrap paper pieces. Thanks for sharing. am I the only one who wants to know what the inside of the cards says... I am loving this btw and plan to make many! Darn cute! Love the string (hee hee). I've got something similar planned for Valentine's Day. Lovely ideal for a lovely card. oh my goodness, that is so completely awesome. And I love that you don't need a template to do it - just free cutting. this card is ADORABLE! great idea. I'm really into bunting at the moment. what a great card. I love making my own cards, but often have trouble finding the time to do so. Last evening I was working on making envelopes from scarps of wallpaper. those are super adorable! I can see it adapting to so many occasions - Christmas lights for holiday cards, little rattles or something for a baby, flowers for weddings, hearts for Valentine's Day. And my husband doesn't read my blog either. haha. Jess - Popping by to read the comments, and I had to chuckle. I have the opposite issue. My husband reads my blog, but my mom NEVER does. LOVE this card! Just looking at it brings out all the happy. This is absolutely ADORABLE!!! What a wonderful idea...and a perfect way to use scraps of string and paper. Thank you for sharing! This is the cutest card ever! Gret idea! I tried it out as soon as I saw your post. PERFECT! My husband's birthday is TODAY and I was so focused on dinner menu and making him the perfect chocolate cake (maybe: trying a new recipe) that I forgot to get a card. Thought, "that's okay, I can make him something unique," except I didn't have any great ideas for that. Until now. Thank you!! You are so full of creativity... I can barely stand it! I might do a variation for my daughter's birthday party invites. Thank you, always, for sharing. Alex is so lucky! this idea is a keeper. this is incredibly cute...i made a similar card by sewing the bunting onto the card w/ my sewing machine, but love the trick of folding in thirds to hide the ends of the strings. this is really cute. SO VERY CUTE actually. You inspired me to make some mini flag garland for a bottle vase at my wedding. I just LOVE this. so simple and beautiful. can't wait to make one! Wow! I love handmade cards, and that is so darn cute! Your creativity continues to astound me. Aw, I just love tiny things, and I love bunting! This is pretty much perfect! p.s. just stumbled on your blog and have found so many treats... thankyou! oh my goodness, this is just too adorable! i'm completely in love with this card-- how creative and sweet! I LOVE this. I recently started a blog devoted to buntings and featured it today http://garlandspennantsandbuntingsohmy.blogspot.com/2010/01/makit-monday-bunting-card.html Thanks again for this terrific idea. in a * pep rally * blog post! thanks for making wonderful things! Love this idea. I have been using paper pennant flags for many of my parties lately. This would be a great tie-in! Thanks for sharing the how-tos! That card is looking amazing! I've been really into inspired birthday wrappings/cards recently and this really fits the bill. Thanks a lot. oooh I love this, thanks! What a very cute project.... love it! this is amazing! I can not wait to try it out (even if the closest birthday is mine), perhaps unbirthday cards for everyone! Lovely card. I must try one. It#s so happy. This idea is gorgeous! Thanks for sharing!! clicked the link at mmmcrafts -- I MUST TRY THIS IDEA. I LOVE IT. thanks for sharing. Very nice and sweet! If I someones gives it to me, I would be very happy. I love your card! Just made this for my friend's birthday! Thanks for the great idea!! so cute! i want to make it for my friend but can't see what it says inside. can someone tell me please? I'm sorry to say I can't remember what I typed there, and I don't know where the card is now. It was probably something mooshy and embarrassing anyhow. You'll just have to make something up! Took quite a bit of time, but it turned out really nice! Pretty easy too! Thanks! !